Algae fuel startup Sapphire Energy announced this week that the company has paid off a $54.5 million loan, which was backed by a loan guarantee from the U.S. government’s department of agriculture (USDA), and which was used to build an outdoor farm in New Mexico to make algae fuel for transportation. The payment from Sapphire follows electric car company Tesla’s decision to pay off its $465 million loan from the U.S. government a couple months ago, and demonstrates how in the face of some criticism, certain greentech companies have been able to use government loans to successfully scale and have been able to pay them back on time or early. In contrast, U.S. government loans for clean power and cleantech companies have been controversial following bankruptcies and struggles of a few companies that received loans like solar panel maker Solyndra, electric car company Fisker Automotive, and flywheel company Beacon Power. Many capital-intensive manufacturing focused energy startups have had a difficult time in recent years scaling their technologies between the so-called “valley of death” between trial phase and large scale commercialization. 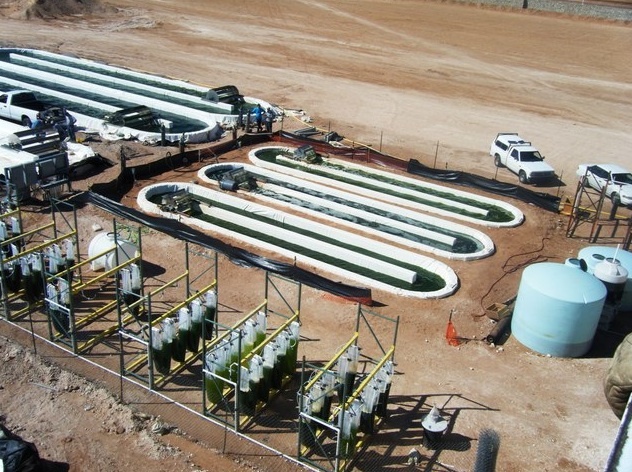 Sapphire used its loan (which is from the USDA not the DOE) to help fund the first phase of its first planned massive commercial-scale algae farm in Luna County, New Mexico. The first phase of that farm is online now and is filled with algae ponds and processing equipment spread across at least 100 acres. Eventually the entire farm is supposed to spread across 300 acres and make 1.5 million gallons of the algae biofuel per year. While Sapphire Energy is already producing its renewable algae green crude, it hasn’t exactly scaled that up to commercial scale. The money to pay off the loan actually came from private investors — the company has raised $144 million in recent funds — and not revenues from algae fuel sales. Private investors and startups have tried to avoid government loans in recent years, given the terms and conditions of such loans can be strict — and potentially more harsh than the terms from private investors. Solyndra, Fisker and others have said the strictness of the loan conditions, aggravated their struggles. Algae fuel companies have been trying to scale technology for years. The issue is that to compete with oil, algae fuel has to be produced at bulk for ultra cheap — as cheap as fossil fuels. A deal between Synthetic Genomics and Exxon to produce algae fuel was scaled back, and companies like Solazyme have spent years focusing on other markets beyond fuel — like personal care and food additives — before tackling fuel.